Switzerland A Chance to visit to Mt. Titlis with Cliff Walk and Lucerne. A Chance to visit Jungfraujoch and Interlaken. 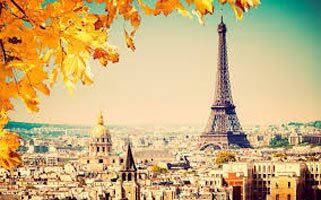 France Guided City Tour in Paris. Visit to Eiffel Tower Level 2 in Paris. airlines on your air ticket (calculated at 1st July, 2016 rates). arrangement which may come in to effect prior to departure. Cost of extension of the validity or deviation from route of your air ticket. Cost of the Suggested Excursions. also food and drinks not forming part of the group menus. Mandatory tips of Euro 3 per person per day for Coach drivers, Guides etc. Anything not specifically mentioned in ‘What your Tour Price includes’ box. Welcome to Zurich, one of the largest cities of Switzerland. On arrival, you will be met by your Tour Manager / Local Representative outside the customs area, who will welcome you and take you to your hotel (Check-in time is after 3.00 pm). Overnight at the hotel in Zurich. After a continental breakfast, the day is free OR we suggest you to Visit Mount Titlis. We proceed to Mt. Titlis, which at 10,000 ft is the highest peak in Central Switzerland. At Mt. Titlis you have free time to play and enjoy in the snow, visit the Ice Cave or just relax at the restaurant. At the Terrace on top of the Mt. 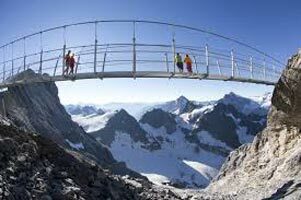 Titlis summit station, weather permitting, you could take a walk over ‘Titlis Cliff Walk’ which is the highest suspension bridge in Europe - at a stomach-turning 9,800 ft (3,000m) above sea level. Later, we drive to Lucerne for an orientation tour. See the Lion Monument, ‘Lowendenkmal’ hewn from a limestone cliff to commemorate the bravery and loyalty of Swiss Guards. You have free time at Schwanenplatz to shop for Swiss army knives, chocolates, watches, souvenirs, etc. Overnight at the hotel in Zurich. After a continental breakfast, we check out and drive to Paris. On arrival, we check into the hotel. This evening is free to explore Paris on your own. Overnight at the hotel in Paris. Afteracontinentalbreakfast,we proceed for a guided panoramic city tour. See Place de la Concorde, the majestic Arc de Triomphe, the fashionable Champs Elysees and the magnificent Opera House. 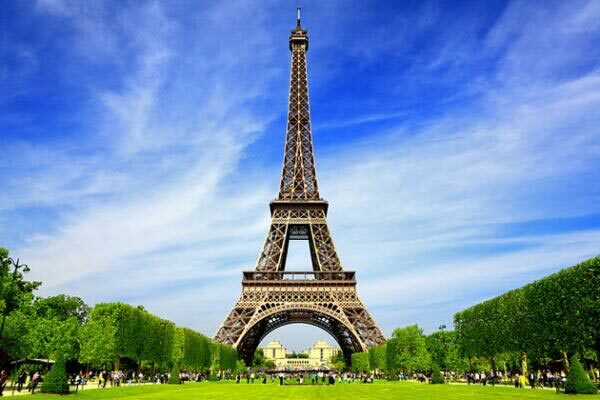 Next, we visit Eiffel Tower, the symbol of Paris, where a bird’s eye viewfrom the 2ndlevelwill leave youbreathless! Later you have time to explore or shop in Paris or we suggest you take an exciting trip to Disneyland, Paris. Get charmed by Cinderella’s castle. Take an exciting roller coaster ride down the Thunder Mountain. Visit Fantasyland and meet Alice in Wonderland, Pinocchio, Peter Pan and Snow White. Get thrilled by the legends of Aladdin and Indiana Jones at Adventureland. Ride a space shuttle to the moon at Discoveryland. Encounter Ghost Ships, Steam trains and Western scenes in the Wild West town of Frontierland. In the evening we take you for dinner and then return to the hotel. Overnight at the hotel in Paris. After a continental breakfast, we check out and drive to the airport for your flight back home. It’s time to say goodbye to all the new friends you have made. We hope you take back many happy memories of your holiday. We would like you to spare a few minutes of your time to write and tell us how you enjoyed your holiday and any suggestions you may have for the future. Destinations Covered : Paris, Florence, Munich, Rome, Pisa, Luc..